Hampshire County Council have published a new Hart school places plan up to 2021. This shows that Hart will overall have more places than required in 2021. 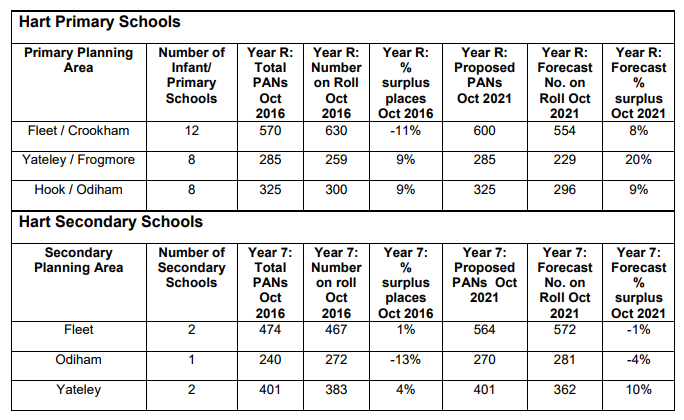 Fleet and Odiham schools will be operating slightly above capacity, but this will be more than made up by the surplus of places at Yateley. Prior analysis has shown that a significant proportion of Hart school places are taken from pupils who live ‘out of district‘. This new forecast from Hampshire challenges the need for a new secondary school in Hart district. However, these figures don’t include planned new developments such as Hartland Village (Pyestock), Sun Park and Grove Farm (Netherhouse Copse). These developments are likely to put additional pressure on over-stretched Fleet schools. To us, it would make sense to utilise part of the Hartland Park (Pyestock) site for a secondary school, rather than Murrell Green. This would add extra capacity where it is most needed, and give an extra convenient location for kids in the east and south of Fleet. This would free up capacity at Calthorpe to take extra children from Watery Lane and Grove Farm. We argue that we don’t need a new settlement at Murrell Green, nor the new school. Of course, we shouldn’t build a new school on top of a high pressure gas main. Posted in We Heart Hart Campaign.